After two years of testing with dozens of women and men, iFace is finally here. We began using this formula with women in our upstate New York skin care salon and they went crazy for it. Everyone begged for us to create a product they could use at home and we've finally done it. 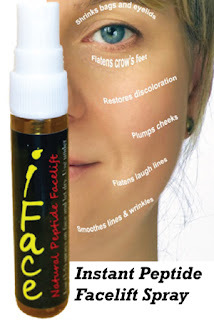 iFace Natural Peptide Facelift is an instant face lifting spray that delivers powerful anti-aging peptides in a natural formulation filled with pro-vitamins and antioxidants. iFace instantly reduces the appearance of fine lines and wrinkles, puffy eyes, discoloration and more. iFace contains Vitamins A, B, C and D, along with Matrixyl 3000, Pepha-Tight, Argireline, Caffeine and Rose Damask. Each tiny bottle delivers 100 sprays providing 30 days of use. It can be sprayed under or over makeup and it can be used as needed. iFace also promotes the production of collagen and elastin while tightening and hydrating skin for as brighter younger looking complexion. iFace retails for $29.99, but if you spend $50 or more at www.Greensations.com, we'll include a bottle of iFace for FREE! No Strings Attached! Spend $50.00 or more and add one iface to your cart. Use coupon code (freeiface) at checkout and get your iFace for FREE. Your blog is awesome and really helpful for readers. Many custom peptide companies companies are provide online peptide services.